When I got back from a long weekend yesterday I came across a new project from the legendary Michal Migurski – “Walking Papers“. The basic premise is that when doing OpenStreetMap (especially in partially mapped areas) we all spend a lot of time scribbling on print-outs of maps. For example see one created by Dave that I’ve blogged about before. 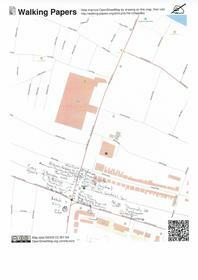 So wouldn’t it be great if you could then trace over the printout to enter the data into OSM? This is where Mike’s site comes in. If you print out your map from his site, it comes along with special pictures in the corners that embed some information about orientation and position. So when you scan it in an upload it to the site, it automatically knows where in the world that scan corresponds to and skews your scan to fit properly. And then you can simply trace over your notes with Potlatch to enter your data. More technical details are available from his weblog. Even if you don’t want to scan back in, it’s actually a good interface for just printing maps for annotation. The only improvement I’d make to the site would be using OAuth to log into OpenStreetMap (so you don’t give walking-papers your password), but since that’s not implemented just yet on OpenStreetMap.org I can hardly blame Mike! I’ll be very interested to see how many people use the service – you can see what I did when testing it out or simply get started yourself! This entry was posted in Uncategorized and tagged OpenStreetMap on June 10, 2009 by Andy.